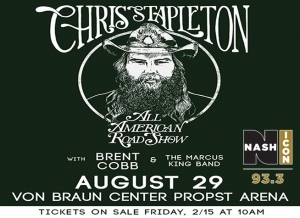 93.3 Nash Icon Has Your Tickets To Chris Stapleton – Aug. 29th At The VBC! Grammy Award-winning Country Music superstar Chris Stapleton is coming to Huntsville! 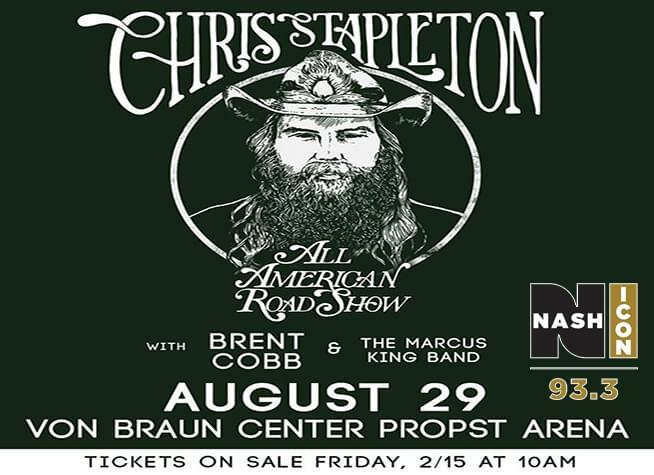 The “All American Road Show 2019” comes to the Von Braun Center on August 29th, with special guests Brent Cobb and The Marcus King Band – and 93.3 Nash icon has your tickets to the show! Tickets are on sale now through Ticketmaster and at the VBC Box Office – CLICK HERE for more info, and listen for your chances to win your tickets with 93.3 Nash Icon!